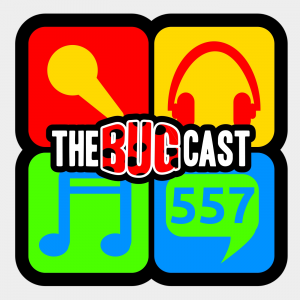 This week on The Bugcast: Dave flies solo due to a miscreant child, a journalist is killed in Northern Ireland riots, an apparent mind-blank on how actually to podcast, and some great Creative Commons music from Sven Turtle, The Mind Orchestra, Curtis Holland Jr. feat. Kevin Edlin, Bryyn, Charlie Mosbrook, The Rabbitts, Romancoke, and The Liquid Kitchen. This week on The Bugcast: Julian Assange is arrested, a podcasting award we weren’t aware of, the apparent misuse of English words, and some great Creative Commons music from Darkside, Husk, Parker, Caitlin MacNaMara, Lilly Wolf, Anna Inspiration, The Hedgerow Folk, and Rude. This week on The Bugcast: today is a school day as we learn about two music-related things we didn’t know about before, and some quirky Creative Commons music from Explosive Ear Candy, Darkside, Richard Shekari, Parker, Dreams From Gin, Tortuga de Mar, Kelly Allyn, and Curtis Holland Jr & Kevin Edlin. This week on The Bugcast: more new tech, Brexit, Daylight Savings, and 8 tracks of amazing Creative Commons music from Square A Saw, Lip Service, Kesakoo, Michael Ellis, The Spin Wires, Ed Napoli, RVNS, and The Riders. This week on The Bugcast: new technology arrives at Bugcast Towers, so we celebrate by bringing you our (not usual) selection of fantastic Creative Commons music from Carrying Goodness, Unden Leslie, Vinyl Blast, Leslie Hunt, Slingshot Miracle, Julie & Gent, The Liquid Kitchen, and MOGU. This week on The Bugcast: it’s Red Nose Day here in the UK, and a dark day for New Zealand. We lighten the mood with 8 fantastic tracks of Creative Commons and independent music from SadMe, Lee Rice, Omonoko, Exmiranda, bARTek, Rising Bones, Monday Of Mine, and Curtis Holland Jr. This week on The Bugcast: we’re back to our normal format, with some more sad news from the world of music and comedy, plus 8 fantastic tracks of Creative Commons music from The Riders, Ryan Martin, Plants, SadMe, Brunela Crochenci, Lee Rice, MOGU, and Lower Loveday. This week on The Bugcast: Dave presents his selection of favourite tracks from the last year, featuring 16 tracks of Creative Commons and independent music from Dr Groove Gang, Dark Park, Carter Vail, IntoXication, Falling Blind, Tyler Gelrud, Fresh Body Shop, Fleurie, Neon NiteClub, The Hedgerow Folk, LukHash, Aphemia, Admiral Bob, Scott Altham, Quentin Hannappe, and The Devil Music Co. This week on The Bugcast: our Listener’s Choice episode, featuring 12 tracks of Creative Commons music, submitted by a good solid handful of our listeners. Music this week from Fallen To Flux, Always The Alibi, Square A Saw, The Vow, Moonshiners, Omonoko, Explosive Ear Candy, Graines De Sel, Lukhash, The Glass Child, The Devil Music Co., and Lost In The World.